She can't hike without her TS Hat now! Thanks for sharing such a special picture! 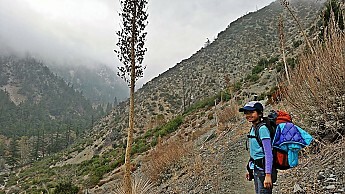 This was taken on the Middle Fork Trail to the Third Stream Crossing campground in the Cucamonga Wilderness. This was taken this past Saturday (11/15) on the way up to camp. More photos to come :) We are planning another overnight this coming weekend with wonderful views overlooking the city of Pasadena CA. She's been on three backpacking overnights so far this month. 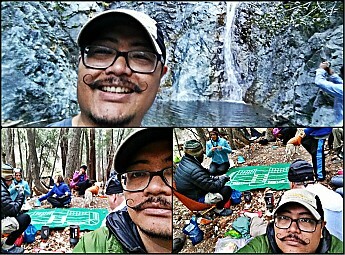 We're both saving up for snowshoes for our December winter trips in the Angeles National Forest...I can't wait for that! You guys are really getting out there! Having snowshoes will be so fun for both of you (hopefully with lots of snow) this winter. That 'stache! I respect that. We're both making up for not backpacking over the summer due to the drought in CA. I hope for good rainfall and snow...we need it. I hope you guys get all the snow you can handle, and all the outdoors you want! I enjoyed the photos Mangus. This forum: Older: TS in Keystone River Cave Newer: Finally, some snow in SoCal!